This Melissa Sweet Cossima Wedding Dress is absolutely stunning! It is really comfortable too. The dress does not have any tears or marks of any kind. It is in great condition and was only worn one time. The dress has been bustled and the bustle is beautiful and simple. 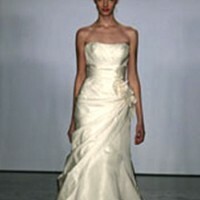 They used the "tie method", so you are easily able to tie the dress up to be bustled and untie whenever you would like. Just to give an idea of the length of the dress, I am 5' 4" and my shoes were right around 3-4 inches high. The dress was dry cleaned and preserved as a wedding gift directly following the wedding. I have taken the dress out of the box once to take pictures of it, but besides that it has been hanging nice and clean in the garment bag.